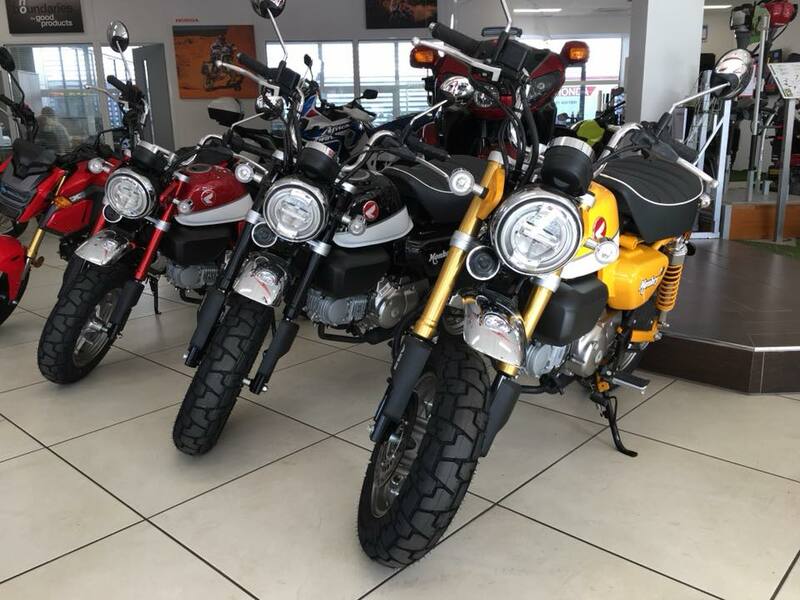 The 2018 Monkey bike has arrived into the showroom here in M50 Honda. 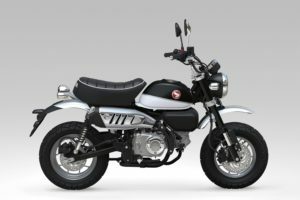 The Honda Monkey bike is perhaps most widely known as a groovy icon of the 1970s, but it first saw the light of day in 1961. Originally developed as a 49cc child’s plaything for Tama Tech, an amusement park in Tokyo, it proved so popular that a road-going version was developed. Its popularity was based on a cute, instantly-likable design, tiny dimensions and ultra light weight – which made it a whole load of fun around town. By 1978 – a point that marked the start of real prime time for the Monkey – the machine had been re-styled with a teardrop style fuel tank, and became hugely popular with legions of RV (Recreational Vehicle) drivers in need of convenient transport to use once they were parked up. And this is where and when the cheeky Monkey really cemented its place in millions of hearts; with its 3-speed gearbox and centrifugal clutch (which needed no ‘traditional’ motorcycle skill to operate) it gave thousands of riders their first experience of twisting the throttle on a powered two wheeler. Because it was so much fun, and so easy to ride, it did more to sell the concept of motorcycles to a wider public than perhaps any other machine. 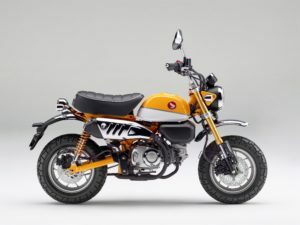 With its chunky tyres, mini-‘ape’ style handlebars, miniscule fuel tank and big, squashy seat the Monkey look is unmistakably of its time, but – just like the affection in which it is held – also timeless. 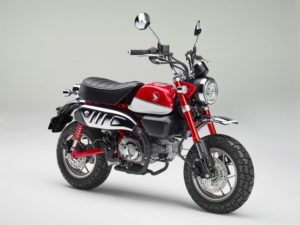 Now in 2018, Honda’s genuinely iconic mini-bike is re-imagined for the present day, with styling that draws heavily on the original, complemented by modern, premium touches such as USD forks, twin rear shocks, LCD instruments, IMU-based ABS and full LED lighting. Its 125cc air-cooled engine delivers 6.9kW power, and fuel efficiency of 67km/litre; wet weight is a mere 107kg. Read more about the Monkey Bike here.